The supermarket that has recently opened in the vicinity of Dusseldorf’s Königsallee is one that you can describe only in superlatives. And PÖDÖR’s Premium Oils and Vinegars have been an integral part of this project since the start, pleasing every one of your senses. The Pödör family business, with their press masters having produced excellent quality, premium oils for four generations, presents itself with their full range of cold pressed oils and fruit balsamicos/ vinegars at several spots in the Zurheide Feine Kost store found in the Crown House. 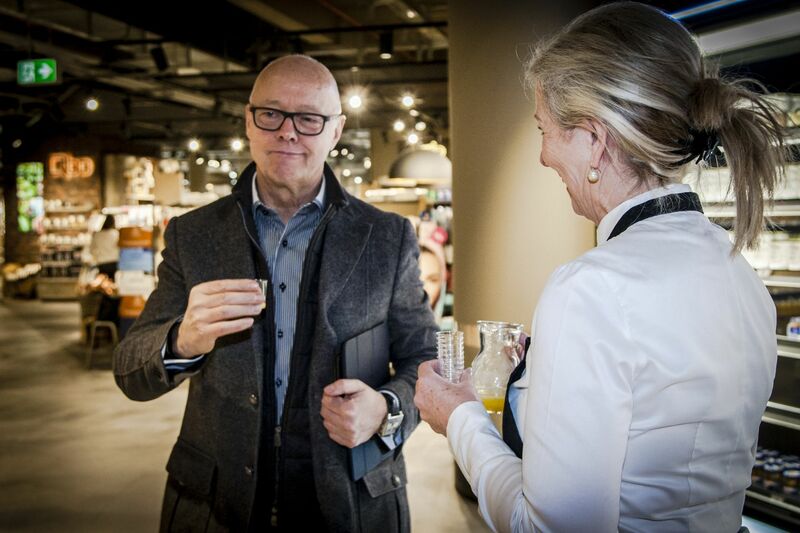 The secret of this unique fun shopping is the unique oil press that they exhibit, making it possible for the customers to not only taste the PÖDÖR oils but also to experience their intensive fragrance and even be part of pressing process. 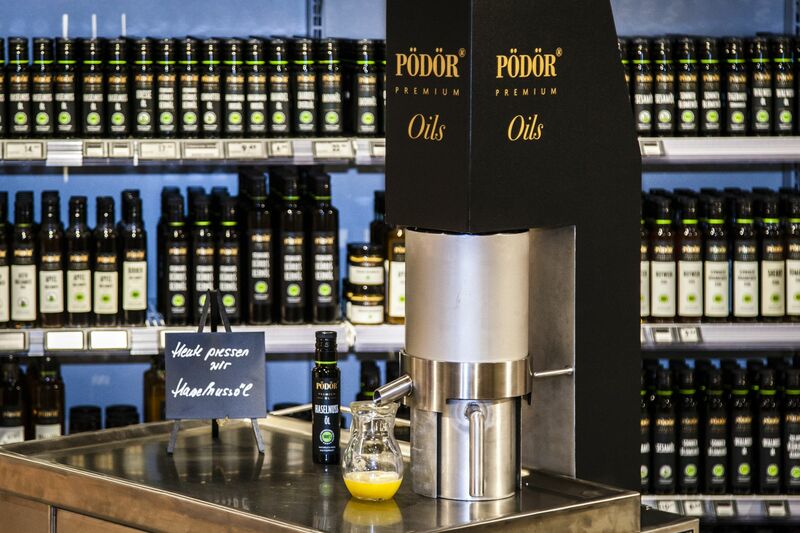 PÖDÖR wishes to bring close to the customers the extraordinary quality of its cold pressed oils. That’s why they decided to press the freshest of oils from pistachios, macadamia nuts, piedmont hazelnuts, walnuts, linseeds or sunflower seeds “live” at the Deli department of the Zurheide Feine Kost store, with a mobile hydraulic press machine which they developed for this specific purpose. And so, the customers at Zurheide can enjoy the opportunity of tasting directly the freshly pressed and still warm oils, which is bound to render them unable to resist the magnetic power of the fragrances of freshly pressed nuts and seeds. „With this unique hydraulic press machine, we want to demonstrate step by step the cold pressing method employed by Pödör, and to bring our top quality premium oils closer to our customers. After all, the secret of Pödör, i.e. 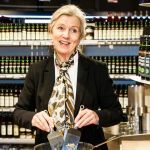 the secret of our oils carrying so intensively the flavor of their seeds, lies both in our high quality basic ingredients and in our pressing method” – explains Helga Wachtmeister, representative of PÖDÖR’s German branch. The oil press offers the opportunity for tasting the oils only on the spot but PÖDÖR offers the full range of its products at Zurheide Feine Kost in the Crown House, with more than 30 kinds of conventional and cold pressed organic oils as well as with its various fruit vinegars and fruit balsamicos, in bottles of 100 ml and larger. 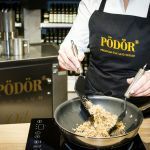 For the customers to be fully convinced of how PÖDÖR’s products can make fine dishes even more fine and exquisite, all they should do is try out the gastronomical delights that Zurheide Feine Kost offers on its premises. The Pythagoras vegetarian restaurant, which provides for the needs of exacting vegan and vegetarian clients, uses PÖDÖR’s oils and balsamic vinegars. In the smoothie bar, it is also the PÖDÖR oils, together with other PÖDÖR products – such as the protein containing tiger nut flour – that enrich the various shakes and smoothies. The energizing breakfasts served in the café are prepared with Pödör oils, too, and the basement restaurant uses PÖDÖR’s oils and balsamic vinegars to make its gourmet dishes even more unique. Three-Michelin-star chef Thomas Bühner has been absolutely thrilled by the experience of tasting the oil pressed in front of his eyes, and calls it an unforgettable culinary moment. 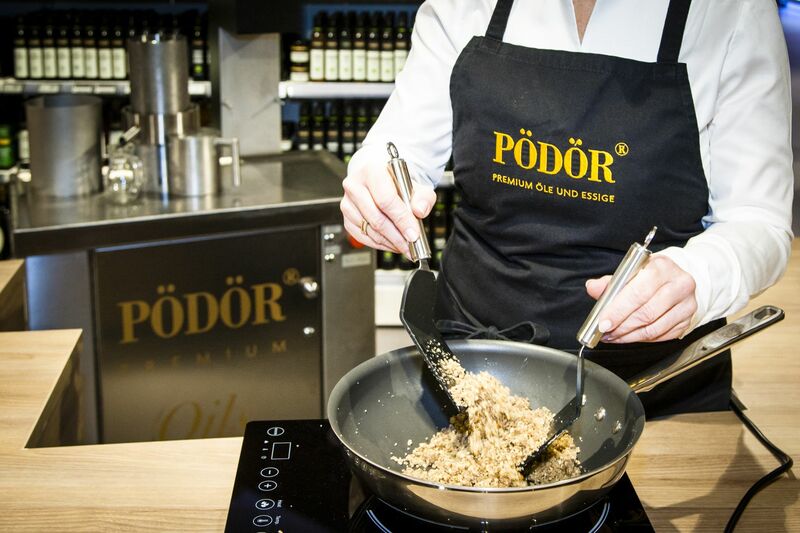 „The PÖDÖR oils are undoubtedly the perfect choice to make our dishes even more delicious, lending them an extraordinary flavor” – enthuses the star chef and ambassador of the PÖDÖR brand. 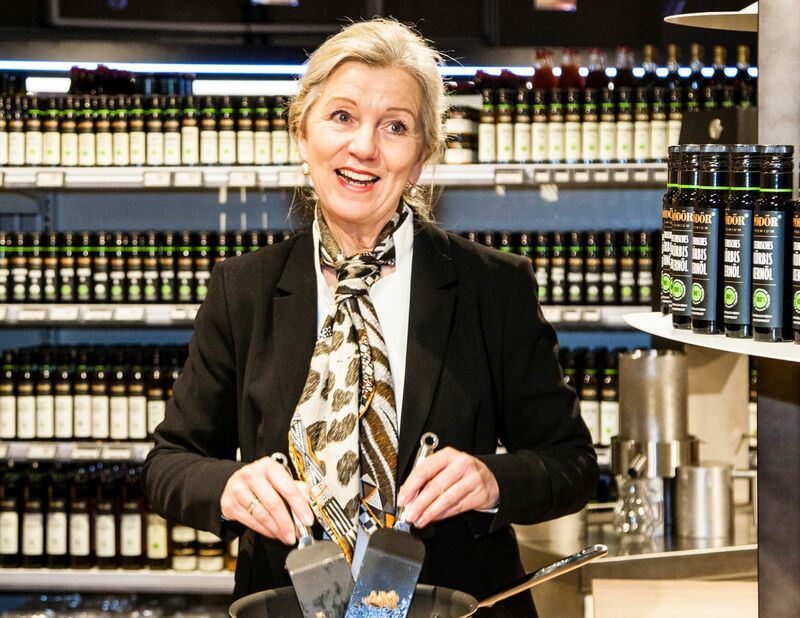 A family-run business, PÖDÖR has been developing and producing premium oils and vinegars since its founding in 2011. 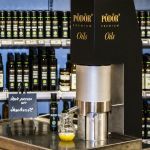 The PÖDÖR press master is a co-founder of the company, and has been producing cold pressed seed oils for four generations now. So PÖDÖR can draw on more than 100 years of experience in the production of the highest quality oils, to develop products that are in line with the zeitgeist of today’s discerning consumers. PÖDÖR operates in more than 10 countries worldwide, including England, Germany, USA, Australia, Japan, Taiwan, Hungary, Austria and Switzerland. PÖDÖR is a rapidly growing international premium brand and currently exports over 90 percent of its production. PÖDÖR – the best from the seed: Only thoroughly cleaned, 100% natural top quality raw materials are hand-pressed by the most experienced press masters. All products are bottled only after the strictest quality control, in order to preserve the healthy, unsaturated fatty acids and vitamins. The product range currently encompasses 27 cold pressed premium oils, most of which are certified organic, as well as more than 20 different fruit and balsamic vinegars. 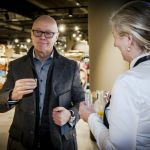 PÖDÖR supplies the international gourmet cuisine market, including many star chefs, as well as premium retail food outlets. All products can be bought in select specialty shops and in the company’s own online shop. More at www.podoroils.com.